A Boca Raton non-profit is teaching the future protectors of paradise what they can do now and in the future to stop litter and pollution from ruining the ocean and the planet. 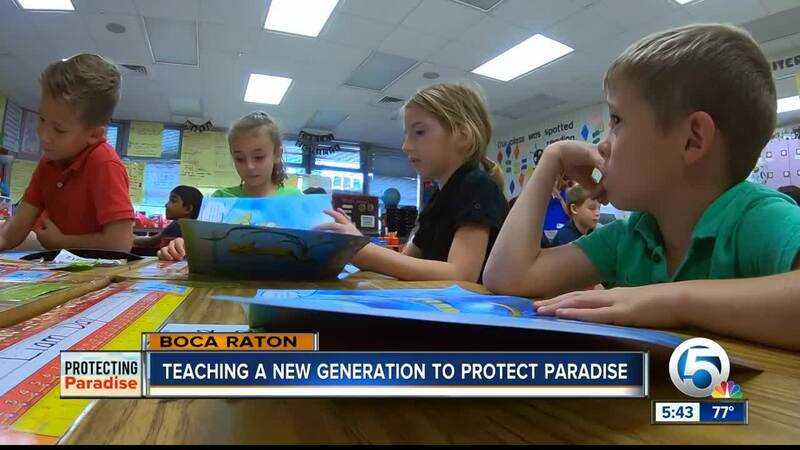 BOCA RATON, Fla. — A Boca Raton non-profit is teaching the future protectors of paradise what they can do now and in the future to stop litter and pollution from ruining the ocean and the planet. "I read that this is the last generation to save nature," said Jessica Gray, founder of Boca Save Our Beaches. The organization coordinates beach and corporate cleanups, while also promoting and educating people about conservation. Gray realized there was an opportunity in educational curriculum to teach about local environmental issues. "I talked to a few friends who are educators and introduced this idea. Do you guys have anything in your science program that explains our sensitive South Florida marine ecosystem? And everyone said no," said Gray. "So that’s when I thought, why don’t we do something to introduce that concept, even if it’s a one-day lesson plan or a week that you study the effects on our ecosystem." Gray wrote a children's workbook to go along with her group's educational efforts. The workbook centers around a character named Seymour, a seahorse who shows children what kind of debris is in the ocean, why it's harmful to marine life, and what they can do to prevent plastic and litter from getting into the ocean in the first place. "It just instills that in their mind the next time they see a piece of trash they would pick it up," Gray said. On Wednesday, Boca Save Our Beaches went into first grade classrooms at Calusa Elementary School in Boca Raton to teach children about being a responsible steward of the environment, and introducing critical environmental concepts to young children such as "reuse, reduce, and recycle." "It’s bad for the animals and the ocean because it gets into the ocean and hurts the animal," said McKinley Hragyil, a first grader at Calusa Elementary. The children did hands-on activities differentiating plastic from natural elements found in nature, such as shells and seaweed, and then did a mock beach cleanup by picking up plastic pieces off the floor. "If you can ask educated questions and get a good answer in return, you can then be able to develop a lifestyle that protects the ocean, protects themselves and makes the planet much more sustainable in the long run," said Morgan Knowles, program educator for Boca Save Our Beaches. Anyone can purchase a workbook through the Boca Save Our Beaches website by clicking here.